I finished up at Google last week and am now working at NICTA, an Australian ICT research institute. My work with Google was exciting and I learned a lot. I like to think that Google also got a lot out of me – I coded and contributed to some YouTube caption features, I worked on Chrome captions and video controls, and above all I worked on video accessibility for HTML at the W3C. I was one of the key authors of the W3C Media Accessibility Requirements document that we created in the Media Accessibility Task Force of the W3C HTML WG. I then went on to help make video accessibility a reality. We created WebVTT and the <track> element and applied it to captions, subtitles, chapters (navigation), video descriptions, and metadata. To satisfy the need for synchronisation of video with other media resources such as sign language video or audio descriptions, we got the MediaController object and the @mediagroup attribute. I must say it was a most rewarding time. I learned a lot about being productive at Google, collaborate successfully over the distance, about how the WebKit community works, and about the new way of writing W3C standard (which is more like pseudo-code). As one consequence, I am now a co-editor of the W3C HTML spec and it seems I am also about to become the editor of the WebVTT spec. At NICTA my new focus of work is WebRTC. There is both a bit of research and a whole bunch of application development involved. I may even get to do some WebKit development, if we identify any issues with the current implementation. I started a week ago and am already amazed by the amount of work going on in the WebRTC space and the amazing number of open source projects playing around with it. Video conferencing is a new challenge and I look forward to it. Six weeks ago, on a fatal Saturday, both my washing machine and cute little Mario died in one day. The washing machine was quickly repaired, but there was no hope for Mario, as the burnt smell of electronics indicated. It wasn’t going to start up again. Mario had been the first server to run the code developed at Vquence. It was our development and testing server for more than 8 months until we moved to a server at The Planet – later to Voxel and now ultimately to Amazon. After it was relieved off Vquence duty, Mario became what it was originally bought to become: a media server. Running Linux and MythTV, it was the beloved center of our living room for the last 2 years. But it seems the heavy duty VCR work as well as running Linux exhausted him. 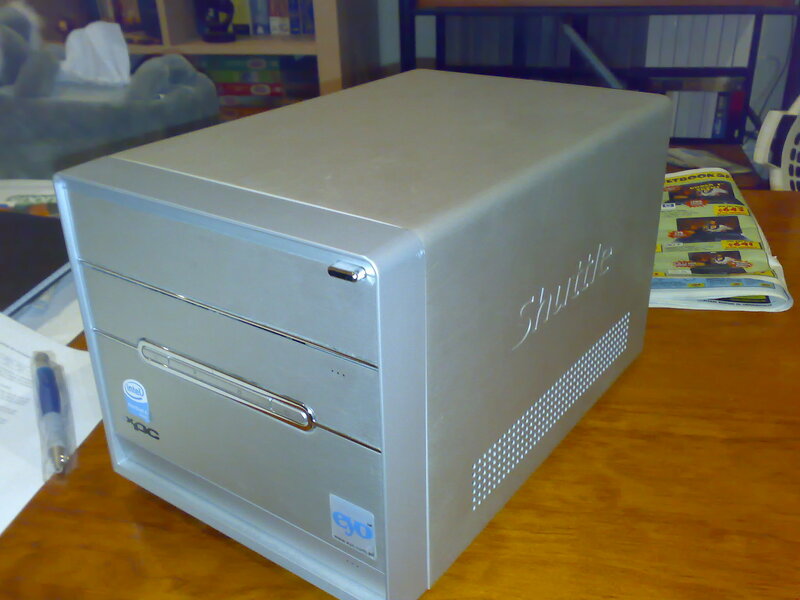 Well, it is now replaced by an ordinary HP machine – I will miss the cute little shuttle. If anyone wants the remains, let me know. I have spent a lot of time recently researching Sydney-based agencies to invite to the upcoming Launch of our Vquence VQmetrics service. This involved finding their websites, finding out about their target business (do they do online video? ), finding a relevant contact, and emailing an invitation to them. I am close to institutional confinement! Then, once the pages are loaded, it is always a surprise to see what the agency has come up with. At the beginning of the exercise it was a surprise. Later it became a nuisance. Now, I am utterly terrified before opening another agency Website. Will it break my browser? Will it start playing a video? Will it start playing music so loud that it blasts off my ears? Will I feel really stupid because I cannot navigate the site? Will I be able to locate the “Contact Us” section? Will they have bothered to publish an email address or do I have to fill in a stupid contact form that I know nobody will look at? Will the contact email work or just bounce? It almost feels like the creation of the Website is a competition between the agencies as to who can create the maddest, most unusual, and most unusable Website. Please, please! Can I just have a simple, usable site with obvious navigation, a simple and fast loading list of reference work, and a list of key people working at the agency with their email contacts? Oh, and Mumbrella has just published a post that gives me scientific proof that this is a conspiracy against me by the agencies! No, stop that – I am not ready to be locked up yet! Today I logged back into a Bebo account that I hadn’t used in ages. The first thing it asked me to do was to add friends – and like so many other social networks it does so by logging into one of your email accounts and finding email addresses. Since their terms and conditions say they won’t store your gmail password and just retrieve email addresses, I tend to use this service to add a few select friends. But Bebo is really f….d up in this respect. Parden my words, but today I have spammed each and every one of my contacts and all the mailing lists I am subscribed to, I have been blocked from multiple mailing lists and my email has probably been marked as spammer by many, so that I may ultimately have to change my mailing account. It was unintentional and I apologise to all of you who had to suffer. If you look at the second post, it has screenshots. My screen was indeed slightly different to that. I had three sections with contacts – one already on Bebo out of which I selected a hand-ful, ones suggested as contacts through contacts which I completely unselected, and a third one with all my email addresses. Each of the sections had a submit button. Naturally assuming that only the ticks in the particular section would be submitted with the button underneath that section, I clicked ok underneath the hand-ful of selected contact. Half an hour later I am now totally shattered and don’t know how to apologize. The only interesting effect out of this faux pas is that within the first I hour I made 22 friends! An amazingly fast way to get to a lot of friends in a social network. Unfortunately, Bebo has broken my trust and made it to the bottom of my social networks, so if you’d like to be in contact with me, try me on LinkedIn or Facebook. Pia posted details about a OLPC rollout to PNG for February 2009. If you are interested in volunteering for this and other OLPC rollout projects you should hop on over to OLPC Friends wiki page and leave your details. It’s an amazing opportunity to make a difference. Whatever happened to the Innovation Review? In September, as reported, Terry Cutler delivered an extensive review on the Australian innovation system and what should be done. But then, the worldwide economic downturn hit us, and nobody seems to think about creating incentives for Australian innovation any longer. Where did it go? Nothing is happening on the innovation website. In particular as a small business owner, I ask: what happened to incentives to innovate for SMEs? Before the review, the government as a precaution scrapped the existing Australian grant system for innovation – in particular the Commercial Ready grants. The idea was to have some leeway with building a new system. That seemed fair enough at the time – but it seems more and more that there will be no replacement for this scrapped funding. Is the government simply forgetting what they promised in view of other, more pressing needs? Do we need to remind them? Terry Cutler in a recent interview with SmartCompany paints a dark picture for the Australian future. He is aware that commercial innovation originates from SMEs and is fearful that by dropping all support for SMEs, the whole SME technology sector will be wiped out, with a negative influence also on larger companies and Australia will fall so far behind in innovation that it may be hard to ever catch up (remember what we did with our advantage in creating computer hardware at the time of CSIRAC?). The Commercial Ready grants and other innovation funding were abruptly scrapped in May 2008. It is now more than 6 months later and we haven’t seen an indication of anything new to replace them. In the midst of the global crisis, how can we make this important cause heard? Yesterday was a long and fascinating day of discussions about innovation in Australia. At this year’s Pearcey Medal and NSW Pearcey State Award event, the focus was on the recently released innovation report from Terry Cutler with a focus on the effects on ICT (Information and Communication Technology). I took home a few very interesting observations from reading the reports and from the discussions at the Pearcey event. But before I can comment, I have to state which organisations I see as ICT innovators in Australia. The government-funded ones are the Universities, NICTA and CSIRO (CRCs fall in the same general class). The big drivers of transforming new research outcomes into business are start-ups and the SMEs. Further innovation happens in large companies and multi-nationals with a stronger focus on incremental innovation rather than disruptive innovation. In ICT, we need to add another big driver of innovation: open source software. I’ll explain this later in more depth. At the Pearcey awards, we had long discussions about whether ICT was appropriately represented in the report and whether the recommendations are pushing ICT further into a supportive role while missing our opportunities to innovate and lead in core ICT. …because of your outstanding contributions to Australia’s computing sector, but haven’t had the chance to put yourself out there? Or you have a friend who really deserves an award for his excellent work? Here’s your chance. This year’s NSW State Pearcey Award is open for applications and nominations. It is one of the only Australian awards that singles out individuals and their contribution to the Australian ICT profession early in their career (where “early” is used rather flexibly to mean anyone who has not yet reached the end of their career). If you have made any outstanding technical innovations or created novel commercial businesses in IT in NSW, you should consider sending in your CV. Previous award winners can be seen here. There are some excellent people – even some from the open source community. In 2006, James Dalziel of MELCOE won the award. Jeff and Pia Waugh won last year. And I was myself highly commended in 2006 for the Annodex work we did at CSIRO. I don’t usually complain about companies and their sales approach, since I know how hard it is to sell things. But today I had a house call by a Telstra person and his sales practice was so dodgy – it’s just not something I would have expected by such a respected company as Telstra. He came with a clipboard, had a name tag, and was on the verge of running away again when I got to the door – he really made the impression of a busy technician and took notes in his clipboard while we were talking. He asked me whether I was with Telstra and I said no. He further asked who my phone line was with and I said iiNet. He then asked whether iiNet was looking after our physical phone line connection and I said probably no, but rather that it still belonged to Telstra – I found that a strange question to be asked by a technician who should really know, but then he might be new from India and not know everything yet. He then said that in this case his information would be interesting for me and said that on Monday and Tuesday between 9am and 5pm Telstra would be undertaking work on the phone cables in my street and that I would be without connection, both Internet and Phone. I said ok, if it cannot be helped and thought that was it. But that wasn’t it. Out of seemingly personal curiosity, almost as if he was making a decision for his own personal home, he asked how I was going with iiNet. I said good. He asked how much I was paying and how many phone calls that would include. I stated the rough amount and that my phone charges were really low and that amount almost covered all my phone calls and Internet connection. He then went on asking how much bandwidth I had. I stated the summary of peak and off-peak bandwidth to which he asked how much was peak and how much was off-peak. At this point I was getting slightly annoyed, since he could as well look up all these details on the Internet and really doesn’t need to get them from me. But then came the really weird part. He then said that with this bandwidth I could barely surf the Internet and my phone line would be really crappy. He then started trying to sell me a Telstra ADSL service. This is where I got really annoyed and almost loud. I said that I knew what I was doing and that for what I am getting from iiNet I would have to pay 10 times as much with Telstra and that under no circumstances would I switch back to Telstra services. He seemed to understand that he wasn’t going to sell me any phone or Internet services today, so he switched topic: what about a Foxtel account then? I said no thank you and good bye and closed the door. So, now, I am actually wondering whether his initial statement that our street will have an outage on Monday and Tuesday is actually correct or whether that was just a way to get his foot in the door. I am really pissed off with Telstra for such dodgy sales practices. Unfortunately, their complaints department does not answer calls on a weekend and their technical department was not willing to confirm an outage on Monday and Tuesday since I am not a Telstra customer. Telstra: I really wished your sales people would play fairly in the market. I could see so many neighbours talking to your sales guy and considering his offers that I almost felt like going over and uncovering his lies. He is making false claims about other Network’s services, he is making false claims about technical details and he is trying to open the door with a possibly false claim on a technical outage. Plus: I have to wait until Monday before I can tell you about it. How much worse can it get? I have spent this weekend giving my Blog a work-over and extending the page set about myself – something I have been putting off for 5 years! I now have a proper Website for Gingertech and I finally have the list of my publications up. I have quite an extensive list of publications, so have been wondering for a while how to publish them such that it will be easy to manage. I have used a nice little WordPress plugin called “List Subpages” to get the hierarchical set of pages onto the site in a nicely structured way. I’m actually missing a RSS feed of these pages, but that’s not a major problem. I’m happy with what this provides for now – it’s a good start. It will make those people happy that have been bugging me for my publications and to whom my sad reply has always been to send them an extract of my CV. I still need to add some of the abstracts of the publications into the posts, and complete the links to where you can download them. More work for further weekends. This is a good start for now and I am happy with it.